Dinner tonight was inspired by my lovely afternoon spent at the Power of Women conference at the Metro Toronto Convention Centre. Okay to be honest most of it was a bit of a yawn and at points it was downright offensive BUT I went because the keynote speaker was none other than gay icon/heartthrob/superhero Ellen Degeneris. I have been a huge fan of Ellen for a long time now. In fact when I was in elementary school I wrote a book report on Ellen’s autobiography. The assignment was to choose a piece of non-fiction writing that we felt inspired by. Other children chose to write about key historical figures like Nelson Mandela, Marie Curie and Ghandi. But for me, a sassy 4th grader who spelled women with a “Y” (because the word men in our name when they don’t define who we are…obvz) and spent most of my life living on an organic farm/hippie commune, Ellen’s unique brand of spunky, self-effacing joi de vivre seemed to strike a chord. I saw her as a woman who had experienced alienation as a young person and bigotry as an adult but still managed to muddle through it all with compassion and a crooked half smile the world can’t help but love. I’ll stop gushing. Really I will. But not before passing along the recipe I used for my dinner tonight. And in honour of Ellen’s kind animal lovin’ heart, it has a little vegan twist. Directions: In a small saucepan heat non-dairy milk and hummus until just boiling, reduce heat and add in the remainder of the ingredients. Stir until smooth and heated through. **To thin out the mixture you can always add a little extra milk or broth OR to thicken combine 1 tbsp of cornstarch with 3 tbsp of water, add to the sauce and simmer for 1 minute. Boil 1 serving of your favourite whole grain noodles according to the package. 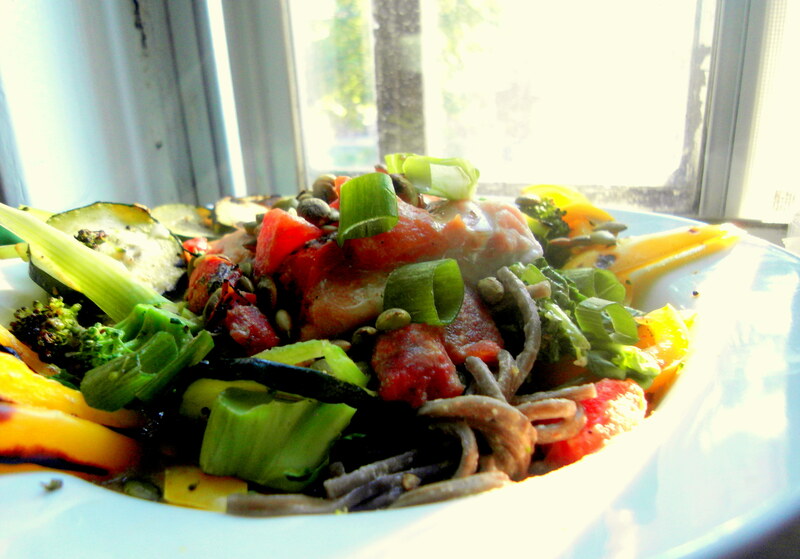 I used Japanese buckwheat (soba) noodles. Toss 1/2 yellow pepper, 1/2 zuchini, 2 large handfuls of spinach, and 1 floret of broccoli in a little olive oil, salt and italian seasoning (oregano, thyme, garlic powder) until well coated. Grill or stir fry until they blacken a little and are cooked through. As the veggies are cooking prepare your protein of choice. The options are limitless here but my suggestions are: 1/2 cup shelled edamame or 1 serving of herbed tofu (either of which you can just toss in with the veggies) OR 1 fillet of steamed, grilled or broiled fish – ideally fatty varieties like salmon or tuna. Drain your noodles and place them at the bottom of a large bowl, covered in about half your sauce. Then add veggies, protein and the remainder of sauce. Am I the only one out there who loves me some Ellen? Yum! Plus, I’m seriously jealous you got to hear Ellen speak! Tell me Portia de Rossi was there, please? But seriously, the ThighMaster? I heard RUMOUR that the two of them were spotted eating at Fresh but sadly I saw no sign of Portia. And yes Suzanne Somers & her thighmaster were RIDICULOUS. Women’s empowerment apparently looks like a workout video from 1997. I love Ellen and I love this recipe!! Good call on using soba noodles. For some reason they taste so much better than pasta in these hot summer months.